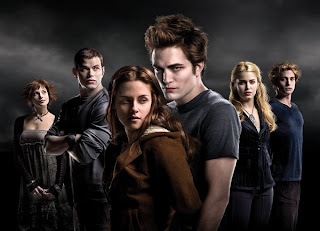 "It has been a month since I last saw the movie twilight and still I cannot get over it. Nhejj insisted that we watch the movie, but I was skeptical and hesitant at first to watch it because of my natural aversion to all things mushy, romantic and too-good-to-be-true happy endings. Moreover it was being compared to Harry Potter, and being a Rowling fan from the start I was defensive about it, until I watched the movie and I decided that I was right and at the same time wrong. I was right that nothing could compare to Harry Potter because it's unique, and twilight tackles a different shade of the usual young adult fantasy genre. Rowling and Meyer are good in their own styles of writing and there's no doubt about it. I was wrong about the aversion thing because I liked it, in fact I loved it a lot. So much was my fascination for the story that it set a record high for me. No book that has caught my attention has ever hooked me to read it non-stop until twilight. It somehow unleashed the voracious reader in me. It even altered my ADL's (Activities of Daily Living) in a profound kind of way. I never slept, I skipped meals, not because I was never hungry, but because I forgot to think about eating. My mind was so focused on it that I was so immersed in the story. Never have I had a relationship with a story as intimate as this one. So back with the movie, after that, I was so eager to read the book. Good thing Nhejj has the entire saga and so I borrowed them. She gave the first two as bringing the four will be inconvenient for her. And so I read the first book in one day beginning the second instantly after. The second book, New Moon, was the most memorable for me because it was the most emotionally intense of the four. The pain that Bella felt in the story reached me and somehow got to me. I actually cried reading the book. I had two days of waiting time to endure to continue reading the remaining two books because Nhejj had trouble with her schedule, but I understood only my patience didn't, and so i was like silent agony to suspend my longing to read the rest but it didn't last long. After two days I began reading the third book and the fourth and final book, Breaking Dawn, the day after. I should say that I was kind of disappointed on the way Meyer designed the ending to be, because all the while I expected it to deviate a little from being "too safe" because after all it's the ending. Why not make it a little more extravagant and edgy, have some explosions here and there, kill a minor character, machinate a war of epic proportions and end it with a loud bang! and the heroes win...but it didn't happen. Only the "they lived happily ever after" scene made it. So I felt short of it and then I remembered that this was supposed to be a young adult fantasy and I am no young adult, I wish I was, but I'm not. So much for wishful thinking. But come to think of it, it may not be perfect to me but to the million of teenagers who have read it , maybe it was. All in all the saga was worth keeping in my collection. Ten, twenty or even thirty years after I would still feel the same emotions I felt when I reread it because now, it became not just a book, but a relevant one. So this is what they call the post-twilight syndrome but I like it though. I would like to let it linger in me for a while. Twilight is a magnificent love story and I am glad it came to my knowledge. The story may seem like an ivory tower to the romantically poverished or for the wishful thinkers but who cares, it is my sweet escape and I'll have it.